My thesis for the MA Interactive Digital Media apart from the deployment of the Augmented Reality Suite presented in the previous post, includes also an in depth research of the augmented reality and the way it has been applied to the cultural heritage sector. This is a report for the project The Augmented Reality Suite for Cultural Institutions [ARS:CI] and its accompanying research. ARS:CI is a software suite comprising of three Apple iPhone applications that take advantage of Augmented Reality to enhance the learning experience in the museum context. The potential of Augmented Reality for cultural heritage institutions has been the subject of research for over a decade, however ARS:CI is one of the first projects, which aim at the development of an Augmented Reality solution for museums and galleries that does not include custom-made or expensive hardware, such as Ultra-PCs, but instead takes advantage of the smartphones on the market. The research methods followed were mainly desktop research as well as interviews with professionals coming from the cultural heritage sector. During the software development process user-testing was involved to retrieve feedback from the users, combined with desktop research on techniques that would optimise the performance of the applications. The study proved that despite the large amount of research in the area of augmented reality for museums, there is only a minority of sustainable solutions, which was eventually appropriated for permanent exhibitions, mainly because of the cost of purchasing and maintaining the designed Augmented Reality systems. The feedback ARS:CI received was positive and professionals with a background in the Cultural Heritage sector as well as Augmented Reality specialists, found in it great potential, as a tool that is able to transform the learning process in a compelling experience. The introduction of the document can be found below. If you are interested in the full document please e-mail me. In addition, since the subject deals with the new media, content such as videos is essential. For that reason, wherever the icon on the right appears in the text, it indicates that there is a relevant video available in the Video Reel below. The videos accompanying the dissertation can be found below. They appear in the order in which they are mentioned in the text i.e. “The ARS:CI”, “The Virtual Dig”, “An Augmented Reality Museum Guide” and “Mixed Reality for the Natural History Museum in Japan”. When I joined that masters course all I knew was that I like the new media in general and a year later, I find myself in full awareness of the subject of my interest. A zillion thanks to all the people related or unrelated to Ravensbourne who helped me throughout the last academic year. For the first term of my course we were asked to develop a research strategy and apply it on a research for the subject of our interest. We had to hand in a 3.000 words essay in which we analyse both our strategy as well as our findings. The topic I chose is how the new media have been used to support/enhance the museum experience. My essay starts with the research strategy followed by the literature review while the third and largest part of the document is the actual study. In the report there are two approaches of the subject, purpose-driven and medium-driven approach. At the purpose-driven approach there are several case studies regarding applications of new media in museums for learning purposes, while at the medium-driven approach there are a couple of cases analysed around the use of the mobile device in exhibition spaces. For my course I had to write a case study on a topic of my interest. For subject I chose the online net art community www.Rhizome.org. The main reason for that is that the book in which I heard about new media for the very first time and changed my life forever, was written by Mark Tribe, Rhizome’s founder. This case study gave me the chance to explore the net art movement and the way it emerged and evolved over the years, during the period when the internet was rapidly becoming the powerful medium of today. Reflecting on that piece of work, I am not very satisfied with my performance. Reasonable since that was my first proper research text, in which there should be bibliography and references for every little piece of information mentioned in the essay. It took me a while to get used to that. Another issue was that it took me ages to finish it, because of getting distracted by all these awesome projects I stumbled upon. That’s probably the price when researching interesting topics. From our course we were asked to prepare a literature review on a theme of our interest. Nike is a world-known sportswear brand, which from its begining had an elegant and meticulous profile reflected on its products, stores and advertising campaigns. 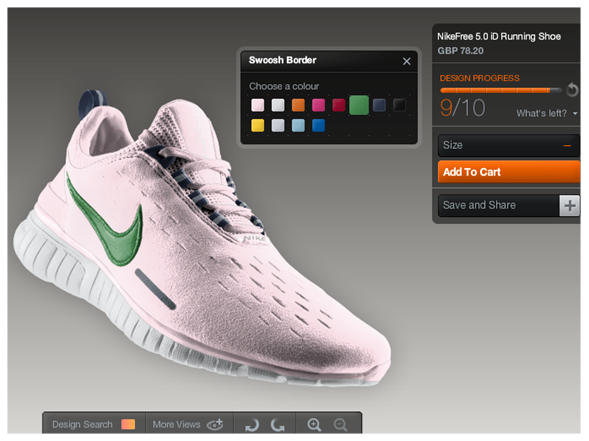 Nike is one of the first companies which realized the power of new media and took advantage of them since their very begining (websites, installations etc.). A representative example is the Human Race which will take place at the 24th of October ’09. As strange as it might sound, NikeTown is a source of inspiration for me. To present the findings of my literature review I made a 5′ minutes presentation as we were asked to do. The powerpoint file is available below with the narration in the notes section. In the presentation I followed the Pecha Kucha style as we were encouraged to do, by using only images for slides, without any text. The picture above is a slide of the presentation.